Vintage Bathroom Ideas – If you are a fan of the vintage style then you need to make sure that the bathroom is in a retro design and is according to the other design of the house. The vintage was one of the most popular trends before and was easy to create it. You just have to choose your favorite bathroom style whether it is with feminine accessories, country chic with some floral scents or neutral colors with chic details. You can also choose modern edges and nice pastel colors for the final touch of the design. Every element of these will provide different result but at the end will be just perfect. You can also choose some busy wallpapers, or flower designs, floral tiles or floral accessories in order to complement them and give girly look. Furniture in pastel colors and wallpaper with flocked pattern can work as well. If you want to make the furniture look unique then you can use some old metal lockers where you can keep the towels and the toiletries. Putting some vintage posters in frames can also give the vintage look. But if you want to keep the minimalist white bathroom then you can just add few accessories and the work is done. The vintage soaps can be stored in a tin or on the windowsill. Better final touch this way. 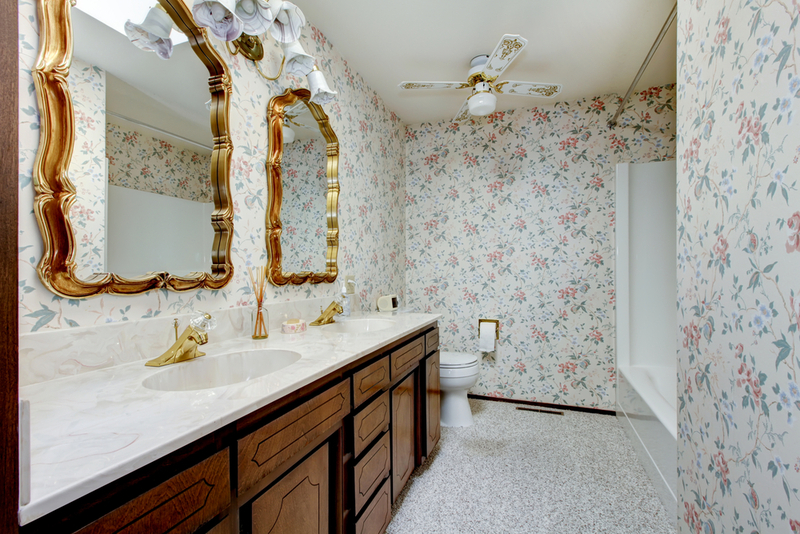 If you want a bathroom with floral motifs then this vintage rose bathroom with floral splash back might be the right choice for you. You can add some fancy taps, gold finishes, floral wallpapers, sprigged curtain, tile splash back with a patchwork effect, towels with flower motif and lot more. This is the best choice if you just love the flower motifs and want your dream bathroom to have this design. 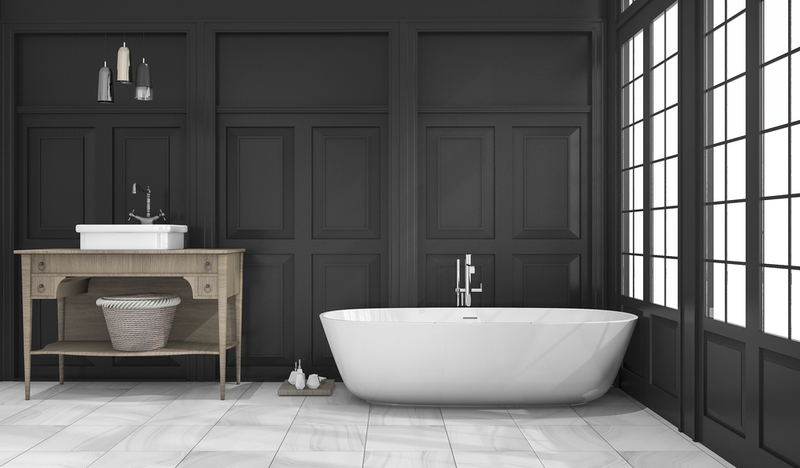 If you want the white effect in your bathroom then the vintage white bathroom with roll-top bath and blue storage unit would be the perfect choice. You will get fun and vintage scheme where you can enjoy and spend your time. If you are planning on buying or repairing the chips or the roll-top baths, you need take into consideration that this can be quite expensive. You can rather buy new cast iron roll-top instead of repairing the old one and refresh the color on the base. You can refresh the color by yourself with a red oxide primer or some paint based on oils, but you need to think about the degreasing and the sanding as well. This is another example of the vintage white bathroom but this time with a heart sign as a decoration. It is very funny and interesting when you see this in your bathroom, so you can put whatever message you want, from ‘we need toothpaste’ to ‘you are late’ or whatever comes to your mind. You can implement some Venetian glass mirrors or a mirror in the shape of a heart. The second option looks more interesting since it will perfectly fit the vintage style. The vintage basin and taps with beveled mirror can be another great vintage idea for your dream bathroom. The vintage taps, the metal basin and the beveled mirror give the perfect design. If you have children it is not recommendable to have shallow basin since you will see splashing water all the time. Also, the space here is an important factor, so it is recommendable to add wall-mounted taps in order to provide more space and better way to clean it easily. 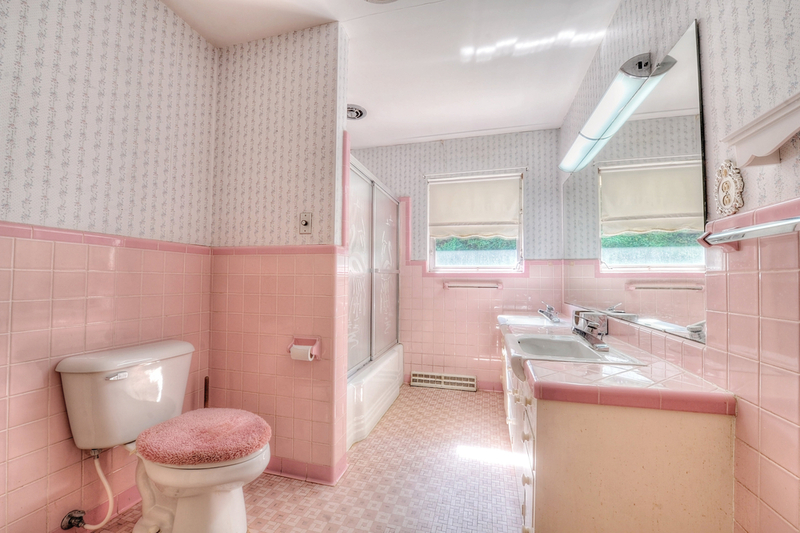 The vintage bathroom unit with floral wallpaper might look quite masculine than feminine, but the floral wallpaper gives the scent of feminism here. You can also have some open shelving unit that can be mounted on the wall or some top marks for the hand towel and the vintage wallpaper. 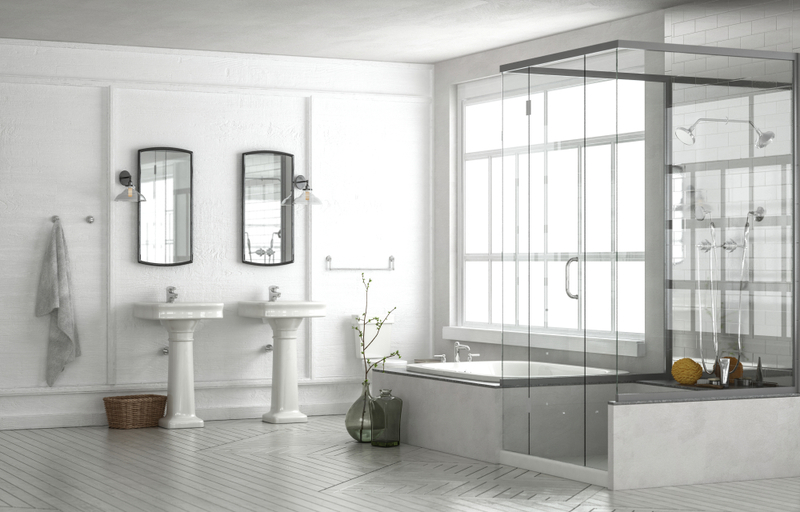 The vintage bathroom with freestanding shower is definitely a practical design with some modern twist. Probably this design would be the best you have seen until now with the freestanding baths. Here are included the flat-panel cabinets, the one-piece toilet, multicolored tiles, floors from porcelain, beige walls, trough sink, freestanding tub and brown cabinets. 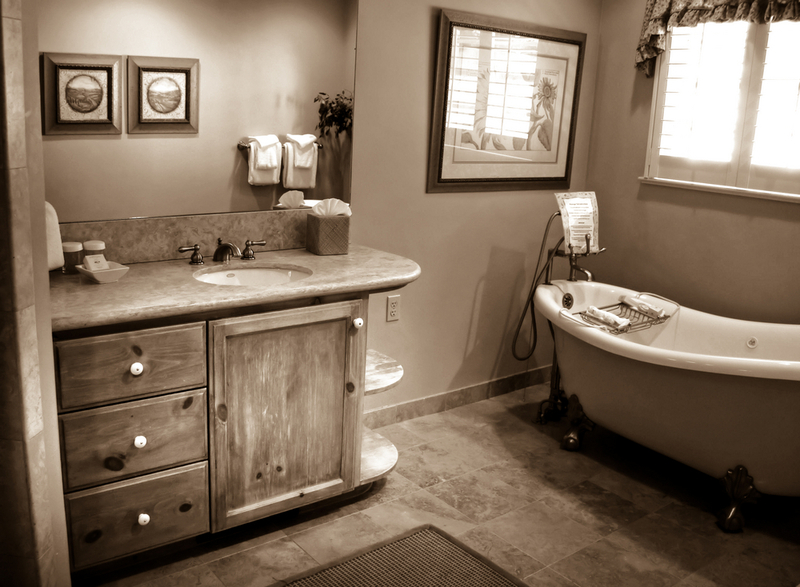 All this gives the vintage style of your dream bathroom. 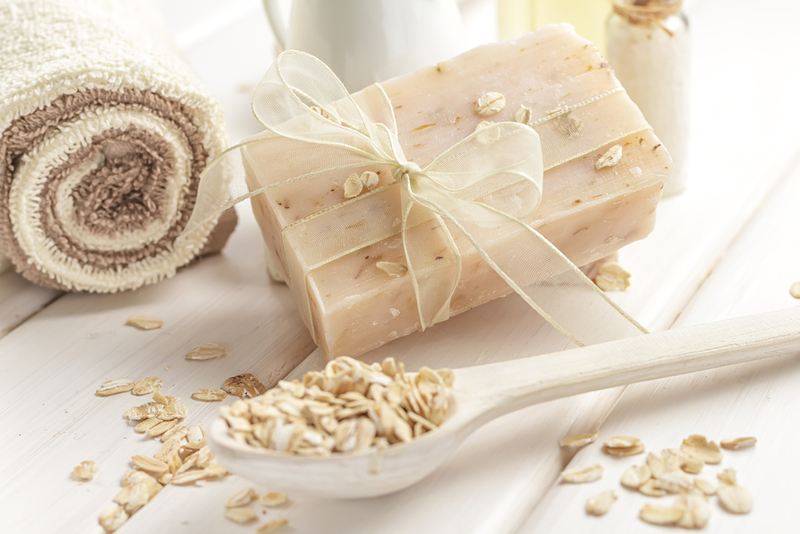 Do you like the vintage bathroom soaps? Of course, you do. They are just perfect and it will be like you don’t want to use them, just have them and watch them as a part of the design. You can stack them in some vintage tin and leave on the shelf in the bathroom. The soap holders can be useful as well since it will provide you more free space and will eliminate the accumulation of remaining of the soap. If you are looking for some inspiration designs for your bathroom, then taking into consideration the Vintage style we can say that this is a design that never dies. What was popular in the 20th century gets its shine these days again. 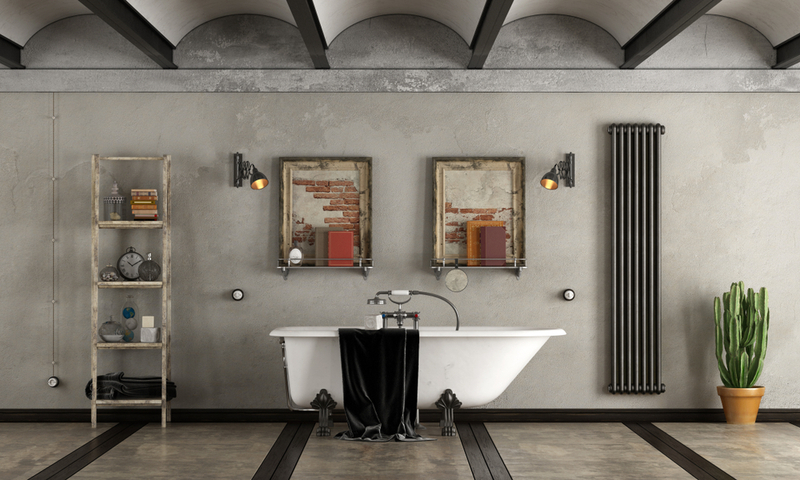 By Peter Jouchmans that is owner of a bath company says that people like to have classical designs in their interior surroundings since they want the things to remind them of the past, they like old-fashioned things. All of the modern designs soon get dated and are replaced with new ones the very next year, if not months. The design in the bathroom should provide the feeling of relaxation and comfort and make cozy, soft and enjoyable environment for everyone. People today like the vintage style of design since it looks very beautiful and it is made of the latest materials and with some modern motifs added. The products of almost every company are made of porcelain or some other material of high quality. Here are some ideas that can help you to get the bathroom of your dreams since you can’t just use the vintage style and turn to the old and classical designs. You have to make some research and consult with the professionals in order to get the vintage style and the modern motifs in your bathroom. That way you can feel more satisfying. In the beginning of every project everyone does some research. Consider this as your project and browse the Internet, read some architectural and interior design books where you can find a lot of examples of bathrooms in vintage style. You can also choose the colors that will reflect the design of your bathroom, since there are a lot of shades and pastel colors available to make combinations with. You can choose the white one as a base and then to add some motifs and decorations with different colors. 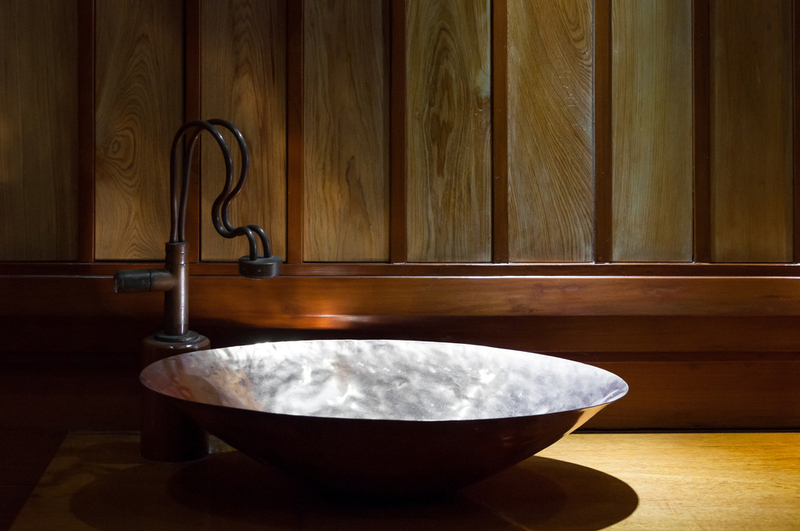 If you want to give more warmth to the bathroom then you can implement some wooden surfaces or vanities in the bathroom. If you want more glamorous look you can use more the modern design and take some inspiration from it and then combine it with the vintages style. It is always a good option. Take care of the furniture as well. Providing large bathtub for your bathroom might be a smart idea. Since the bathtub is the focal point in every bathroom you need to take into consideration the space you got, the type of design and what else you want to implement in the bathroom and yet have enough space for the large bathtub. Everything in the vintage style is in the details. When you take care of every little detail attached in your bathroom then you can know that you have the perfect interior design of it. You can use natural materials for example if you want time-appropriateness or avoid the synthetic materials. 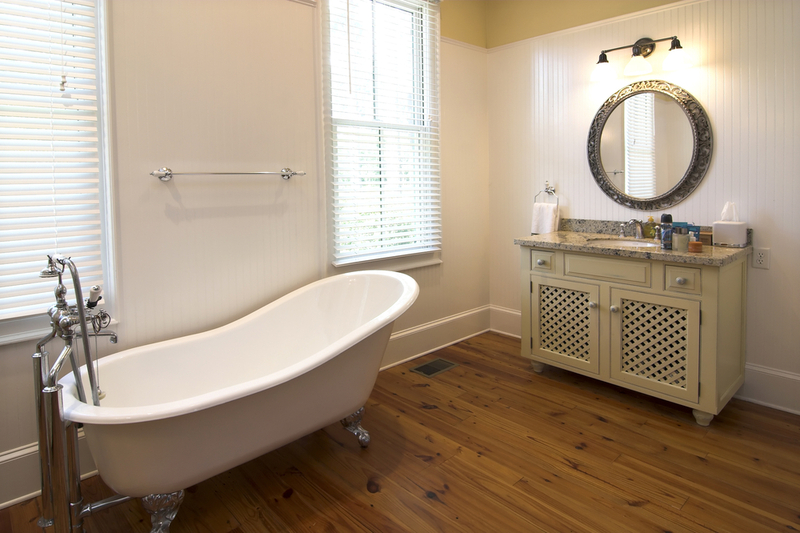 If you are using beadboard or wainscoting in order to cover the walls then it might be a bad idea. The lighting is also important here since you will be spending a lot of time in your bathroom if we make some estimated calculation, then you have to make sure that the light suits you and makes you feel comfortable, that nothing is bothering you. 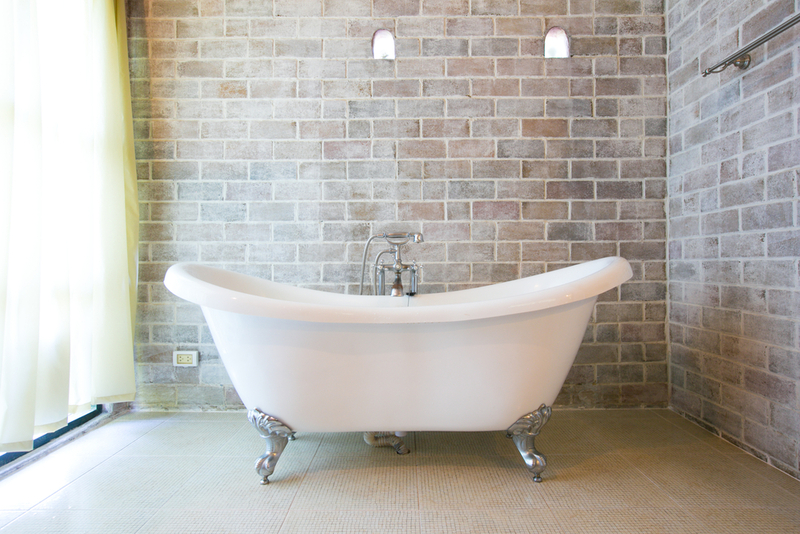 The decorative tiles can also help in providing the vintage look. But you also have to consult a professional in order to choose the design and the color. 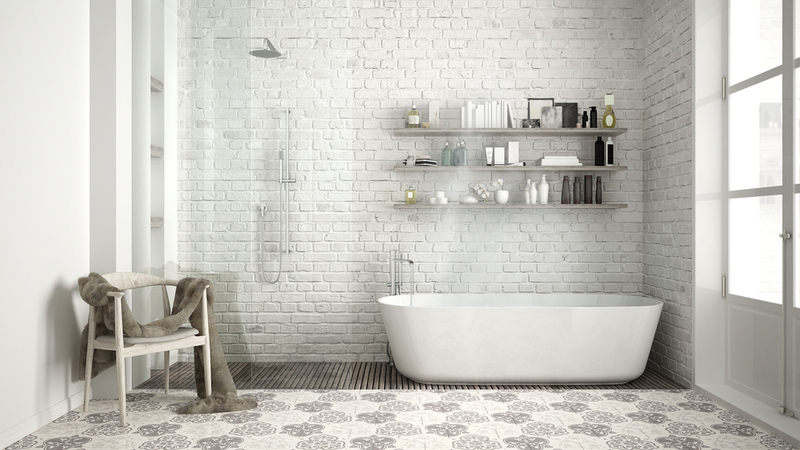 Classical white subway tiles would be the perfect choice. These tiles have the size of bricks and can create period block. You can also combine with colored tiles or black tiles as well. Choosing the textures is also important here since your mood will mostly depend on this. Choosing the copper, the polished nickel or the chrome makes huge difference. If you want more of a sophisticated look then you can use the copper and the nickel. If you implement faucets mounted on the walls for the basin or for the tub. Then you will definitely get more of a trendy look with no need to compromise the design. The classical sinks today are timeless and you can choose some different color than the white. Some of the people say that having exposed plumbing is enjoyable for looking. So they often make that in this way to give some different motif on the vintage style. The ‘thermostatic’ shower might be probably the best functional feature any bathroom could have. You can easily maintain the temperature you have chosen from the time you turn it on. Just perfect.